After our first review of Flying Iguana we got an invite from the restaurant to come back and give them a second shot. We always appreciate when restaurants invite us back because it shows a willingness to accept criticism and grow. Also, from time to time we’ve gone to a restaurant to write a review and just caught them on a bad day. Flying Iguana is a new taqueria located on Atlantic blvd. in Neptune beach. 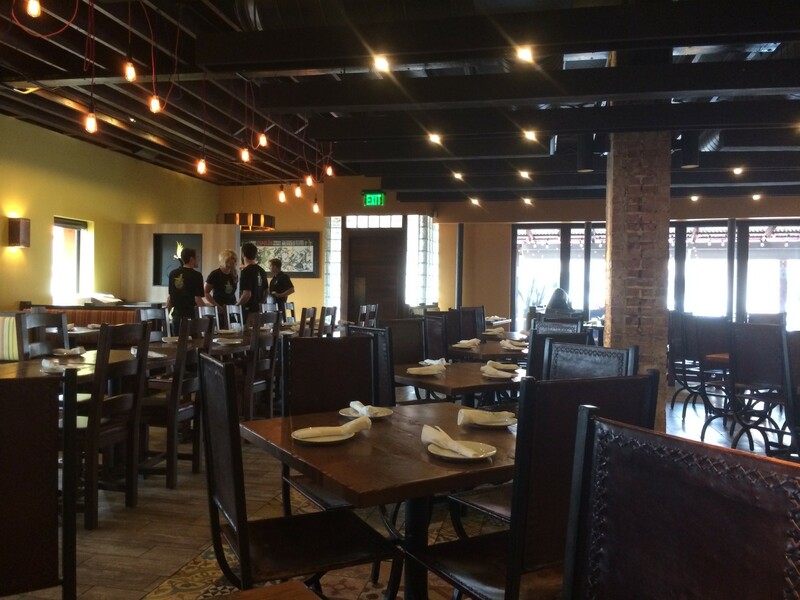 Flying Iguana focuses on Latin Fusion cuisine. 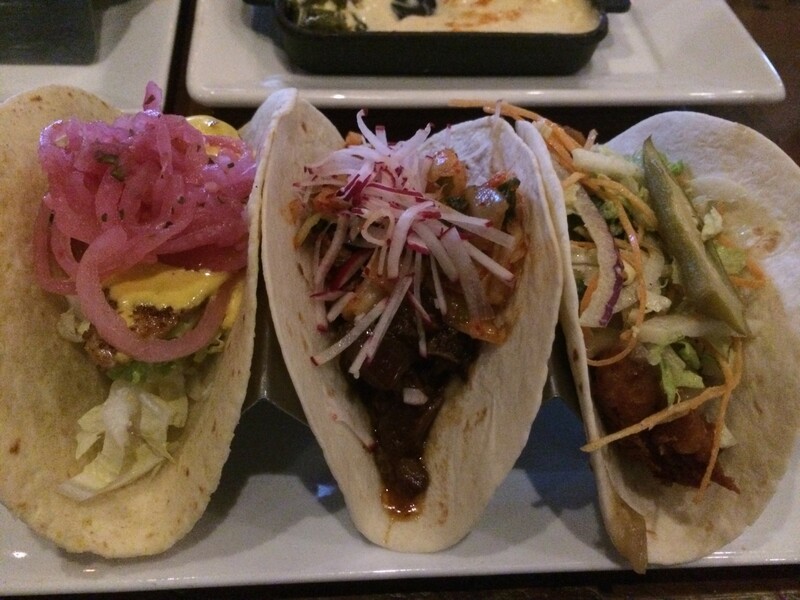 They serve a wide selection of tacos and Latin American entrees. The restaurant definitely has a cool and exciting vibe to it. There’s an amazing mural over of a farmer over the bar that makes you think of fresh flavorful foods. Sitting down to eat here you can’t help but be excited. Note that due to the proximity to Taco Lu and the similarities in menu layout we won’t be able to help but compare some items. Food: We placed our drink orders and were brought a big bowl of chips and two kinds of salsa. The salsas were really good and had quite a kick to them. Having two types of salsa is a nice touch that seperates Flying Iguana from the other Latin American restaurants in the area. We kicked off the meal with some Queso Blanco ($9)- roasted poblano “rajas”, tomato, cumin, and cilantro. The cheese had a rich flavor and was very enjoyable even though it was very basic. It was dusted with spices (although you couldn’t taste them) and accompanied by a little bit of pico de gallo, some sort of sauteed onions or peppers, and tortillas. It was good. However, who charges $9 for a bowl of cheese. I could see if there was some sort of meat mixed into the cheese maybe charging $9. But just cheese for $9? That seems bizarre. It was a lot of cheese though. Next we tried the Esquites char-grilled Mexican street corn, with chipotle aioli, and cotija cheese. This is one of my favorite items at Taco Lu so I was seriously excited to try this one. If I’d never had this before I’d have thought it was good but since I’ve had it at Taco Lu and it’s amazing there, I was a little disappointed. 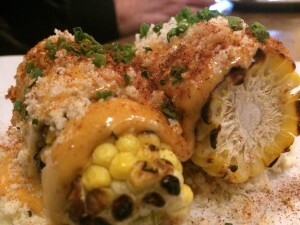 The sauce was okay but in my opinion there was a bit too much of it drowning the corn. After that it was on to the tacos! Reading the menu I was getting excited again. Fried chicken and gravy on a taco? That sounds fun. Fried green tomatoes on a taco? I’m getting pumped up here! Short ribs? Oh my gosh! Bring on the food. Unfortunately my excitement was short lived. I started off with the Flying Fish Taco- today’s catch, coriander seared, with shaved cabbage, aji amarillo, and salsa criolla. Today the fish was Mahi. This one ended up being just okay. I love fusion foods. There’s nothing like seeing a menu item with flavors you wouldn’t expect to be good together and then trying it and being blown away by how the flavors go together. However, this taco had so many flavors it drowned out the flavor of the Mahi. A well-seasoned piece of Mahi is really enjoyable. If you can add a bunch of complementary flavors that awesome. If there are so many flavors that you can’t taste the fish that pretty much ruins things. That’s what happened in this case. A bunch of flavorful vegetables were added then it was slathered in a sauce that tasted like heavy cream and not much else. Next was the Dirty South taco- fried green tomato, black eyed “peaco” de gallo, pimento cheese sauce, and baby arugula. This was one actually pretty good. The only problem was we ordered it for the fried green tomatoes and you couldn’t taste the tomatoes. Again, an overpowering cheese sauce and too many flavors were to blame. At least the pimento cheese sauce was really good. Next up was the Five spice short rib taco- hoisin caramelized onion, shaved radish, and housemade kimchee. I really enjoy hoisin and kimchee so I expected this one to be great. I found the flavor to be odd and didn’t enjoy it. I think this one might just have been personal preference. I’m not sure. Last was what I was sure had to be a slam dunk, The southern comfort- buttermilk fried chicken, redeye gravy, creamy slaw, and pickled okra. Unfortunately this one was a big letdown. They took a great concept and killed it with a bland gravy and a fried chicken that lacked flavor. The pickled okra was pretty good and a nice touch though. Overall I felt Flying Iguana suffered from mediocre sauces that don’t really add a lot to the tacos and overpower the flavors you’re expecting. Service: The service was okay. We came in at 4pm on a Thursday and the place was pretty empty. Our server was friendly and seemed fairly knowledgeable about the menu. We got our drinks and chips and salsa quickly. It took quite a long time to get the cheese we ordered though. 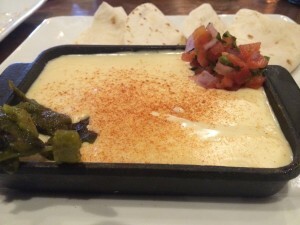 How hard is it to get a bowl of cheese out to one of maybe 4 tables that are occupied in the restaurant? Couple that delay with a table full of servers (ours included) doing nothing at the front of the restaurant and you get a bit irritated and wonder if you haven’t gotten your cheese because the server is too busy hanging out with friends to go grab it from the kitchen promptly when it’s ready. Aside from this though the server was pretty decent and there were no other issues. Flying Iguana is an okay restaurant. Unfortunately for them Taco Lu is right down the street and the food is infinitely better. Skip the Iguana and hit up Taco Lu instead. 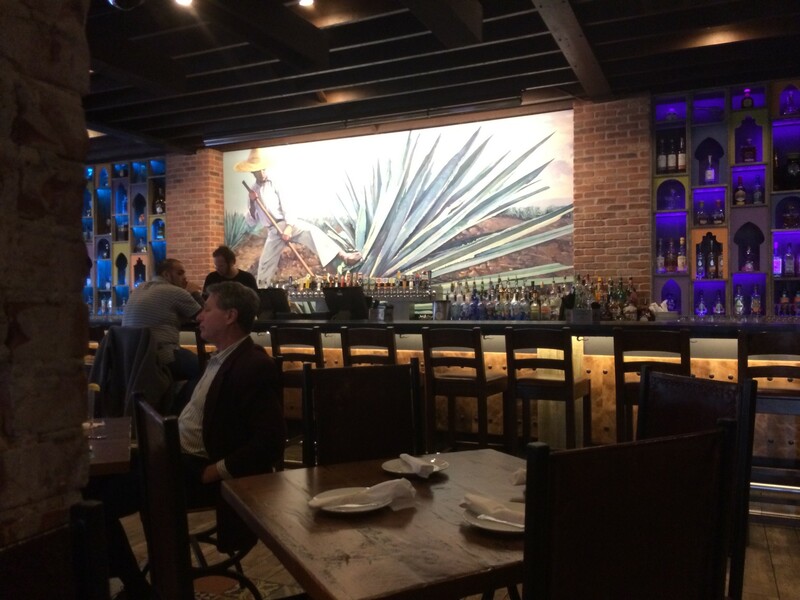 Tagged farm-to-table, Gluten-Free Friendly, happy hour, late night, Latin American, Live Music, outdoor seating, private parties, Southwestern, vegan friendly. Bookmark the permalink.